Looney Pyramids are a set of components that can be used to play all sorts of different games. These gorgeous game pieces come in three sizes that both stack and nest, and are currently available in 9 translucent colors (pink, red, orange, yellow, green, cyan, blue, purple, and clear) and 3 opaque colors (black, white, and Kickstarter green). Traditionally, they were known as Icehouse pieces, since Icehouse was the first pyramid game, in 1986. But over the last 30 years, nearly 500 games have been designed for the Looney Pyramids (named after their inventor, Andrew Looney). 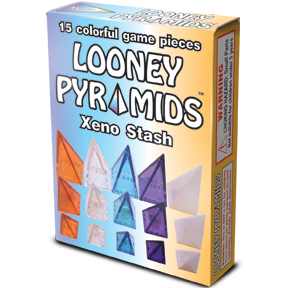 How can I buy Looney Pyramids? 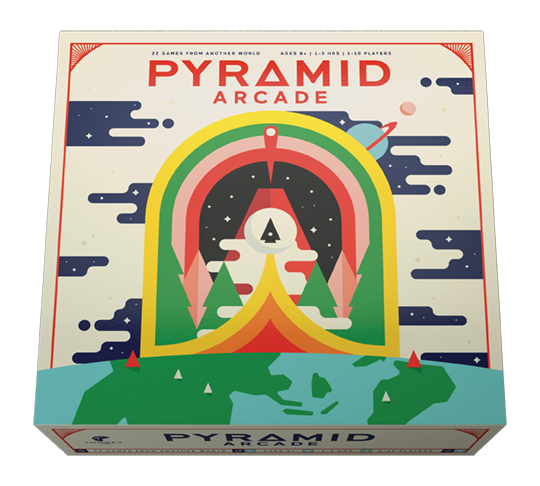 New in 2016 - Pyramid Arcade is a 4 lb board game that contains all the pyramids, boards, dice, cards, and more to play 22+ games - a full library of games in one box! The box includes classic favorites like IceDice, Treehouse, Volcano, and WW5, and long awaited new games like Petri Dish and Color Wheel. 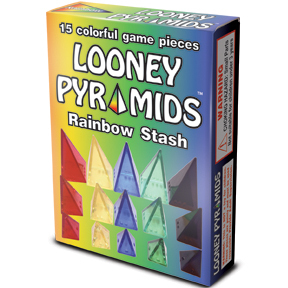 Whether you are new to Looney Pyramids or have been playing with them for years, this game set will bring you endless hours of enjoyment! 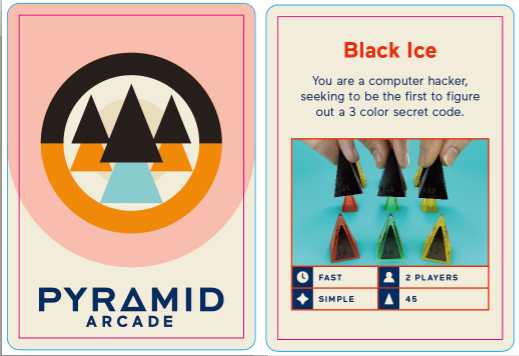 Look for Pyramid Arcade in a store near you - check out this smaller list of game stores who backed our Kickstarter, they will continue to offer the special KS green pyramids! Pyramid Arcade: 90 Pyramids, 22 Games, Endless Fun! Before Pyramid Arcade, we published Looney Pyramid in these little cloth bags, with expansion boxes and a separate rule book, and you might still find any of these items in some stores, even if they are sold out here at Looney Labs. You also never know when you might find one of these really old editions in a little store someplace too! Our online store contains a few other Accessory Products - please Contact Us if you need Single Replacement Pyramids. Starship Captains know at least 10 pyramid games, Space Cadets are new trainees, and First Class Space Cadets have learned at least three games. Introducing Xendo, Andy's all-new theme & backstory for the game Zendo. Long ago Cadet Training, download a fold-up Cadet Syllabus (folding directions). Read about The Ultimate Icehouse Pieces - Crystal Caste made Cut Stone Pyramids! IceHouseGames.org including: Zark City, Twin Win, Quicksand, Apophis, Pylon, Torpedo, Branches & Twigs & Thorns, Nothing Beats a Large, CrackeD Ice, Ambush, Armada, Alien City, Extinction, Hextris, Undercut, Spawl, Martian 12s and 100's more! Games from the now-out-of-print Playing With Pyramids book include: IceTowers, Thin Ice, Zendo, Martian Backgammon, Volcano, Martian Chess, RAMbots, Pikemen, Zagami, Homeworlds, Gnostica, Icehouse.